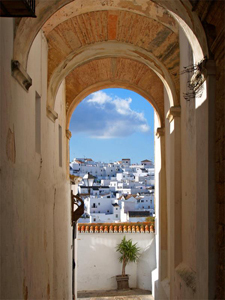 The province of Cadiz treasures some of the prettiest whitewashed little towns of Andalusia. Many of them are in the mountains surrounded by forests of Spanish firs and cork oaks but there are also a few sitting on small hills close to the coast. This is the case of Vejer de la Frontera, or simply Vejer. This sleepy quaint village is a beautifully preserved example of Moorish urban planning. Its narrow and steep streets saw once Christians, Muslims and Jews living in harmony. Nowadays, the quirky houses of Vejer are inhabited by friendly locals who often leave their front doors open and welcome us in to see their patios. Inviting us into their homes goes to show just how friendly and open the local people are, as well as how innovative they are at creating intimate and cosy spaces that combine traditional architecture with the colorful touch of plants and flowers. This tour will take us first to see the unique charm of Vejer to later show us the natural beauty of Cape Trafalgar. There we will take a light hillwalk to see the scenario of Trafalgar battle as well as some of the most beautiful coastline of Andalusia. After our exploration journey of Vejer and Cape Trafalgar, we will celebrate our discoveries with a wonderful lunch in a fabulous local restaurant specialising in fresh Tuna. This day trip is ideal for people staying in other locations in Andalusia wishing to visit these two magic places in one day. It includes private transportation in a modern and comfortable vehicle with A/C to and from your accommodation. Your personal guide and driver will pick you up in the morning and will drive you back in the late afternoon after spending a great day together enjoying the beauty of traditional architecture, nature and local food. This tour can accommodate up to 8 people. The price depends on the group size and the pickup point. If you’d like more information about this tour or would like to book it, you can contact us here.